Journalists outside the Ritz-Carlton hotel in Singapore on Monday. About 2,500 journalists from around the world have registered to cover the summit. The meeting in Singapore took place after some fraught on-again, off-again moments. Where would the leaders meet? Who would be there? What would be on the agenda? We’ve put together a primer on the high-stakes talks that breaks down the key players and the key issues. 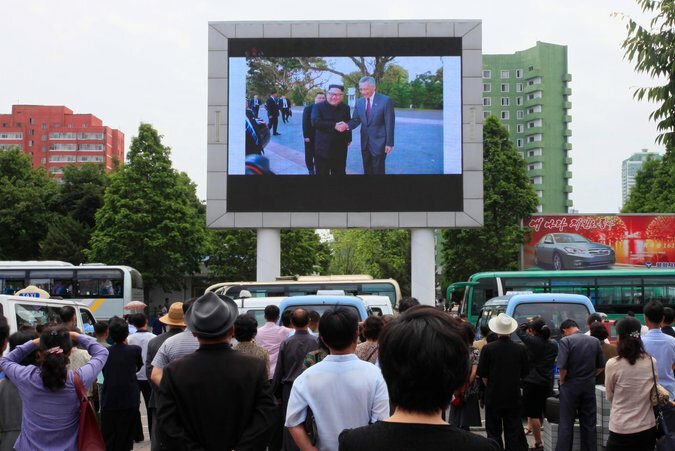 Residents of Pyongyang, the North Korean capital, watched footage of Mr. Kim in Singapore on Monday. While most foreign news outlets began wall-to-wall coverage on Sunday, the North Korean media waited until Monday to report that Mr. Kim had arrived in Singapore a day earlier and met with Singapore’s prime minister. “By reporting that he landed in Singapore on ‘Chinese plane’ highlights not only historic nature of his journey beyond Korea & #China but also signals to his people that DPRK-Chinese relations have been restored,” tweeted Jean H. Lee, a former Associated Press bureau chief in Pyongyang and now a global fellow at the Woodrow Wilson Center in Washington.